Step-In-Sock is a hands-free reusable shoe cover. 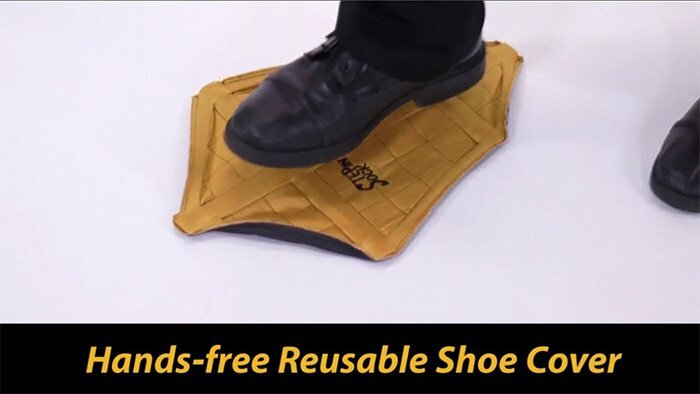 Much like how the disposable shoe cover machine gave you instant covers on the bottom of your shoes for walking around indoors while keeping the floors clean, these step-in shoe covers give you instant shoe covers just by stepping on them. But what makes these different are that they’re fully reusable, and you don’t need a giant heavy machine! Once you place your foot on the top of the Step In Sock, the device will immediately wrap itself around the bottom of your shoes. This way you can instantly cover your shoes, and prevent them from dirtying a nice clean house you’re about to enter. How the step-in-sock shoe cover works. Called the Step In Sock, the instant shoe cover is used by placing the device on a clean flat surface, then just step your foot on the middle of the device and it will instantly wrap around your shoe, covering the entire bottom area, as well as keeping in any dirt that might fall off your shoe. To remove the Step In Sock, just peel it off your shoe, and take it with you. The best part about these step-in shoe covers is that you can use them over and over again without having to create extra waste and plastic use. As of this writing, the Step In Sock shoe covers are available for pre-order on Kickstarter.